It was about 10 o’clock in the evening when my wife happened to notice it on the outside sill of our kitchen window. Responding to her summons I looked out and there it was, right on the sill where the light from the kitchen illuminated it somewhat. The answer to the question of “How’d it get here?” is fairly simple. Scaling the concrete foundation, and siding and making its way around the sill’s overhang is fairly easy for a creature with suction cups on each of its toes. Why was it there? The kitchen light we leave on in the evening attracts the moths and other insects on which it feeds. 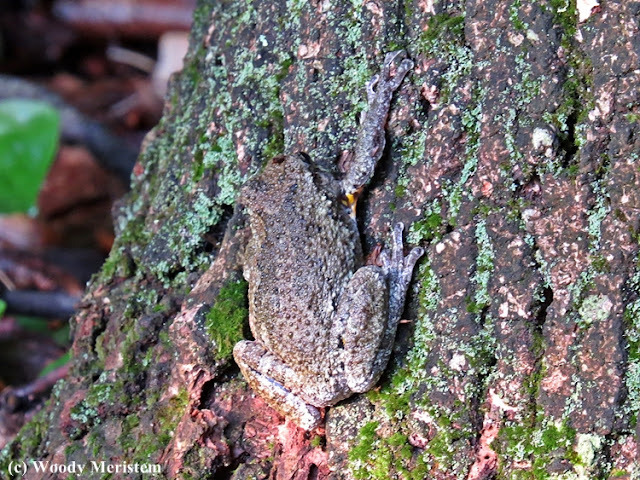 I went outside and easily caught our visitor – the first gray tree frog we’ve seen here after 44 years. Since I wanted some photos of the visitor, the frog was placed in a glass container we’ve used a terrarium over the years where it would spend the night. It quickly demonstrated its climbing ability by climbing part way up the glass side of the container. In the morning as soon as it was light enough for photos we went outside, camera in my hand. With its lumpy-bumpy skin and varied color the gray tree frog is almost perfectly camouflaged against tree bark. 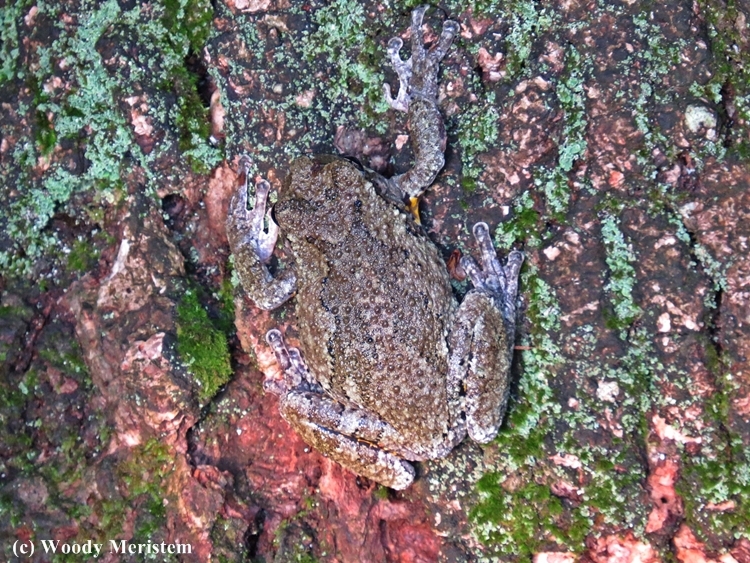 Gray tree frogs, except during winter and the short time when they descend to breed in standing water, spend their time high in the tops of trees. There, they quietly pass the day on a branch and spend the night feeding on insects – especially moths. 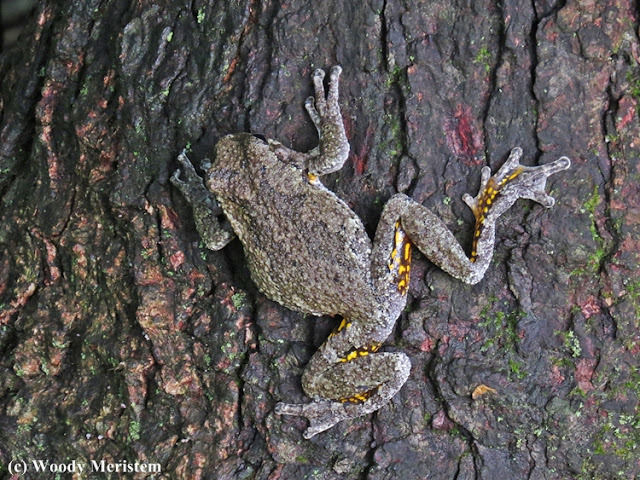 Their camouflage protects them from predators, but if a predator threatens the bright yellow coloration of their inner legs distracts the threat as they leap to safety. Although gray tree frogs are reputed to make good pets, our visitor was released to resume its life in the treetops. Hello, it is nice to meet this new to me Gray Tree Frogs. It is cool how it changes its color and blends in well with the tree. Great sighting, post and photos. Thank you for linking up and sharing your post. Happy Saturday, enjoy your weekend! 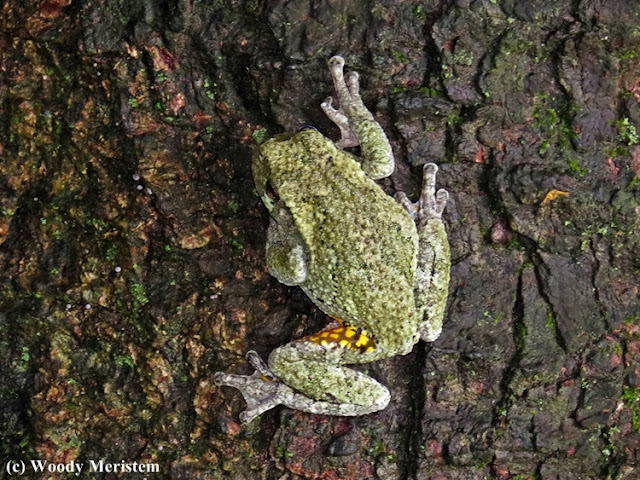 I enjoyed your post and reading the points about the Gray Tree Frogs. Interesting info. Thanks. Excellent documentation of how it utilizes camouflage.